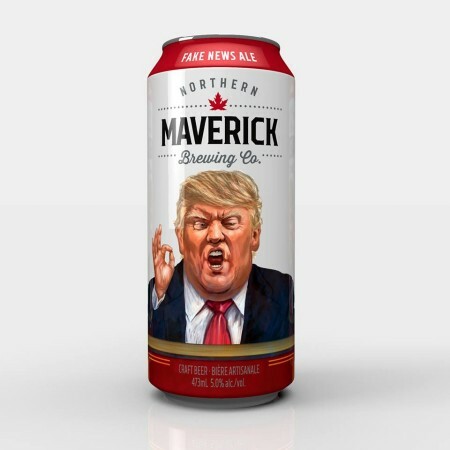 TORONTO, ON – Soon-to-open brewery Northern Maverick Brewing has announced that it will be scrapping its flagship brand, Fake News Ale, following a social media backlash. Originally unveiled earlier this year, Fake News Ale features a caricature of Donald Trump on its label, and was being promoted with red baseball caps with the text “Make Beer Great Again”, a parody of Trump’s “Make America Great Again” slogan and hats. A contract-brewed version of the beer has been available at events and select licensees over the summer while the Northern Maverick brewery and restaurant was being prepared for its upcoming opening. As evidenced by the fact that partial proceeds of sales were to be donated to charities such as LGBTQ-rights group Egale, the beer and branding was intended as anti-Trump satire. But with Trump’s reaction to the recent events in Charlottesville casting him in even more of a negative light than usual, the branding had been receiving increased criticism on Twitter and other social media platforms. With regard for the escalating situation across the border and feedback from our own craft beer community, we have decided to pull Fake News Ale. The idea behind FNA has been very clear from the moment it launched – to shed light on the unfathomable actions and policies of the current administration and help people adversely affected by them. While FNA will no longer be available, we are deeply committed to our charitable partners, and will continue to raise money to support causes that help reverse the impact of the administration’s actions. Northern Maverick Brewing will be opening later this summer at 115 Bathurst Street in downtown Toronto.